The structure and function of shorelands. Reasons for managing shorelands using ecological principles. 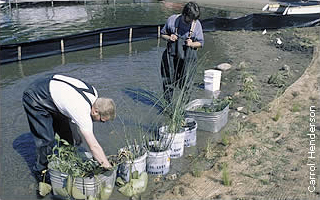 Insights from other lakeshore owners on using a natural approach to restoring the shoreline. Carolyn Dindorf introduces Steps & Techniques. Reading Your Shoreline - learn to see your own shoreline with an increased awareness. Identifying Your Objectives - identify your needs and priorities, important considerations when you plan your own project. 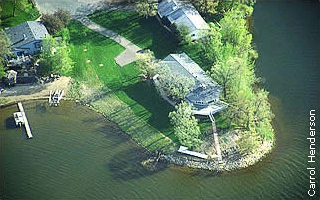 Designing Your Shoreline - this is the core of the "How To" section, a process that has been successfully used by other property owners that will also work for you. Implementing Your Project - field-tested approaches to landscaping your property for long-term success and enjoyment. to bring back the fish, and return the deer. the algae will leave, the waters will clear. Oh butterflies and bald eagles you're what I'm looking for. Shoreline Song, Carolyn Dindorf & Roman Rowan, © 2001 Performed by Carolyn Dindorf, Roman Rowan, and Aaron White.